By now, most people with any connection to the energy sector in Alberta are familiar with carbon capture and storage (CCS) – the proposed technological solution to Alberta’s growing greenhouse gas emissions. 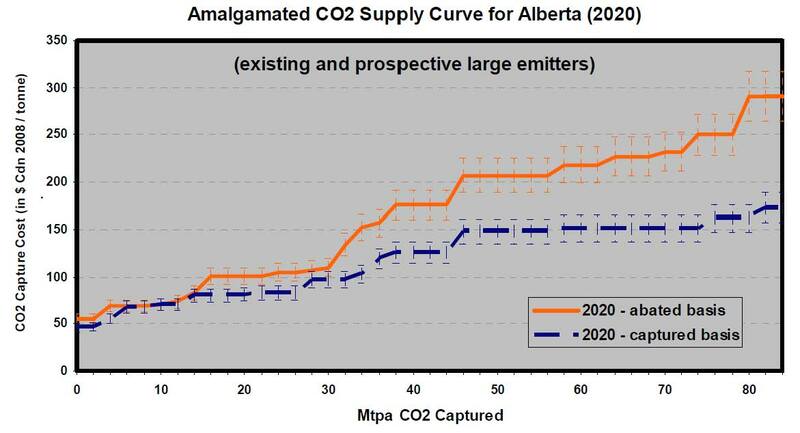 When the Government of Alberta tabled ts Climate Change Strategy in 2008, the goals (shown in the figure below) were to achieve 200 Mt/yr of emissions reductions, relative to business-as-usual, by 2050 and CCS was tapped as the technology through which 139Mt/yr of emissions would be prevented from reaching the atmosphere, and perhaps more importantly from reaching our GHG inventories. The Government has failed to address what I have called 4 hard truths about the implementation of CCS in Alberta. First, CCS is expensive and so the existing $2 billion CCS fund will only deliver, at best, 4Mt/yr of emissions reductions, getting us about 3% of the way to our long-term goal. Second, technological improvement does not mean that the average cost of new CCS projects will decrease over time. Third, there is only one exit strategy for the government from long-term CCS funding, and that is the implementation of more stringent GHG emissions policies. Finally, significant changes in energy markets suggest that CCS may no longer be the most cost-effective option for significant GHG emissions reductions in the province. Alberta Climate Change Strategy Wedge Diagram, Government of Alberta, 2008. The first hard truth is that the Alberta Government has written a check for $2 billion to cover a $2 billion/year promise. The Alberta Carbon Capture and Storage Development Council stated that the projects funded through the $2 billion CCS fund will be “insufficient to ensure that the province reaches its longer-term 2020 and 2050 GHG reduction goals.” In fact, the Council concluded that “an investment of between $1 to $3 billion per year from the governments of Alberta and Canada will be required to promote further CCS projects,” and that, “industry will likewise need to shoulder significant additional investment,” in order for for Alberta to meet its near-term goal of 25-30 Mt of CCS by 2020. There are also additional hidden expenditures already on the table such as royalty relief programs for Enhanced Oil Recovery (EOR) which effectively use oil in the ground to pay for CCS over and above the $2 billion CCS fund. Government funding is required to close the gap (shown above) between the costs of capturing and transporting the CO2 and the net cost or revenue from storing the CO2 in geologic formations. This cost gap depends on several factors. First, the largest cost is capturing the CO2 itself, and this cost is highly variable. Second, the small but scale-dependent costs of compression and transportation need to be covered, and in many cases, this will imply paying up-front for new infrastructure. Finally, the injection of the CO2 may produce added revenues, through EOR or further costs in the case of geologic sequestration. The after-tax net costs of capture, transportation, and injection must be compensated for by payments from government and/or avoided carbon emissions charges in order for businesses to make the required investment. The estimate of the funding gap of $50/ton above, multiplied that by 20Mt/yr, leave a $1 billion/yr gap, and that’s assuming $40-60/ton of EOR revenue and a $50/ton carbon price. Current policies in Alberta likely put that cost gap at closer to $100/ton, hence my estimate of a $2 billion/yr promise. The second hard truth is that the costs of new CCS projects are unlikely to decrease over time. Technology will improve over time, but it is crucial to understand the context in which this learning will occur. In new, purpose-built facilities like NorthWest Upgrading, the cost of capture may be quite low while the cost of capturing CO2 through retrofitting existing power plants or other facilities may be 3-4 times greater. In the Figure shown above, sourced from Ian Murray and Co.’s 2008 report on CCS costs, the cost of CCS increases to well-above $100/ton at the annual quantities targeted by the Alberta Climate Change Strategy. Technology will improve, but CCS will need to be applied more challenging circumstances in order to reach our goals and so the costs of new projects will likely increase. The best analogy I can provide for understanding this cost increase combined with technology improvement is the oil sands industry. There is no doubt that the technology has improved from the time that the original mines were built, but this does not imply that the costs per barrel from new mines like Kearl or Joslyn will be lower than at older mines like Millenium or Muskeg River. High grading tells us to expect the best resources to have been developed first, and so in order for costs at Kearl or Joslyn to be lower than those at older sites, the technological improvements would have to overcome cost increases due to other characteristics of the leases. The same is true in CCS – technology will improve over time and shift the supply curve shown above downward…but these improvements are unlikely to outstrip the rate that costs increases as we increase the quantity we seek to capture and store. In other words, early deployment of CCS might reduce costs for the most expensive facility needed to meet our 30Mt goal from $100/t to $80/ton, but that facility will still likely cost more than those facilities being developed today because it will be a more challenging application of the (potentially improved) technology. The third hard truth I see is in the lack of an exit strategy for government. Looking back at the cost gap figure above, the potential revenue generated by EOR is only about $50-60/ton, and that is in the best plays under the assumption of high oil prices. As we extract more and more oil from EOR plays, and at the same time are trying to increase quantities stored, we are going to have to move to more expensive capture opportunities and toward pure storage plays, which both increases capture costs and turns EOR revenues into a storage cost (you are not going to make money injecting CO2 into saline aquifers unless you are being paid to do so). The only remaining items on the revenue side of the equation are avoided carbon charges and tax benefits, both of which come from government coffers. The only exit strategy, if you can call it that, for government is a strong commitment to carbon pricing or regulatory requirements for CCS. Otherwise, CCS will only happen under a long-term commitment to billions of dollars of annual expenditures under a sustained pay for results approach as recommended by the CCS Development Council. The fourth hard truth is that having a CCS-oriented policy limits companies’ options for GHG reductions, and it is likely to lead to much more expensive emissions reductions or fewer reductions per dollar spent in the long term. When the Climate Change Strategy was announced, gas prices were high and getting higher, with forecasts of over $17/GJ by 2050 being used in leading climate models. Since then, of course, gas prices have fallen and are predicted to remain at less than half that price for the medium term. This means that the portfolio of abatement opportunities available has shifted considerably, and so the push to CCS may not be the right path in all cases. For example, the EIA now estimates that the levelized cost of electricity generation through coal with CCS to be $136/MWh by 2016, while gas generation is expected to cost $63. From a GHG emissions point of view, replacing many of our aging coal plants with gas plants rather than replacing a few with CCS-equipped plants for the same expenditure is an easy decision, but one which a policy based around CCS would not consider – if the Government is going to pay for results, they should not be willing to pay substantially more for a ton of carbon stored through CCS than for a ton of carbon abated in other ways. The Government of Alberta owes it to the citizens of Alberta to come clean on CCS and admit that a long-term commitment to an aggressive fiscal or regulatory framework which goes far beyond the existing $2 billion fund will be required to meet our goals. If we are going to implement a sustained and aggressive policy on GHG emissions in this Province, I believe that the Government should look to policy designs which allow businesses to adopt the lowest cost means of emissions reductions, i.e. carbon pricing, rather than a prescriptive policy which favors one solution over another. I believe Albertans will see the advantages of this as well, if all the cards are on the table. Related to your comments on the potential emissions reductions to be realized via switching electrical generation in the province to natural gas, do you think that CCS may be a bit of a dead-end for policy? I ask this because when thinking of the knock-on effects of something like fuel switching in electrical generation, it’s easier to see how that policy could lead to other emission reduction opportunities, like increased electrification of our vehicle fleet. The policy choices you make at time A influence the options you will have at time B, and I’m wondering what range of options CCS opens up, compared to other choices we could make now. If all CCS does for us is marginally increase recoverable oil reserves while providing marginal emissions reductions, with few prospects of policy options unique to its developmental path opening up in the future, does it make sense to be spending so much money on it? Hope I’ve made myself clear, really enjoying your work. Hi Cody, thanks for commenting and for the retweet. Not sure I follow 100% what you are asking, but here’s a shot. No question that there are dynamic implications of our policy decisions. CCS really amounts to a combined GHG and natural gas hedge which, in a world of really expensive gas, allows you to maintain lower electricity prices than you perhaps otherwise would be able to as you can continue to use relatively cheap and plentiful coal while capturing and storing the emissions. Of course, things have changed significantly in the nat. gas world, and so I would argue that a policy focusing on CCS as opposed to a broader policy on de-carbonizing electricity through a carbon price would lead to more expensive electricity than need be the case in a carbon-constrained world. Other downstream implications of CCS or other policy will depend on how they affect the relative price of electricity…and more expensive emissions reductions will make electricity more expensive than it needs to be, thereby limiting potential uptake of electrification. I don’t mean to say there are no good opportunities for CCS, or cases in which CCS represents the most cost-effective means of emissions reductions. New gasifier-based upgraders are a perfect example of this, since a relatively pure stream of CO2 is produced. However, where that is true, CCS would be the option deployed by firms in the face of a sufficiently high carbon price. If not, the carbon price would drive firms to more cost-effective solutions. Hope that was a little bit of what you were getting at. Thanks for reading. Well done. You’ve taken the time to deconstruct and unpack a lot of the mythology and reasoning behind CCS and bring the numbers to the fore. I appreciate that. To be frank, CCS has always been terrible policy and as a province we can’t ditch out on its public support soon enough. If it makes sense with a carbon tax so be it, but I don’t see that happening. Enhanced oil recovery not actually being a meaningful way to store carbon is one. The increased carbon produced from compressing and liquefying the CO2 being another. The fact that the science and long term environmental effects of storing liquefied carbon underground are, how do you say, extremely unknown. And of course the stuff that you brought up. The ridiculous cost expectations, the fact that this is going to have to scale up massively despite being unproven etc. Thanks Duncan. Agreed that this post only looks at one aspect of CCS, that being the fiscal or regulatory framework required to drive the quantities sought in Alberta. I could and likely will write another post on EOR issues and perhaps one on the pore space issue as well. I do think you would see some CCS deployed under a carbon tax that was sufficient to meet Canada’s 2020 targets, but that number likely to be much lower now that it would have been at higher gas prices. I have a grad student working on this question, with the kind help from the folks at MKJA. Great post. CCS seems like another good example why picking winners in the innovation process is so extremely difficult. I totally agree with you that a price on carbon would avoid this problem and allow firms to implement the techs that are most cost effective for them. Thanks Joel. Always appreciate your comments. There are certainly times when new technologies can use a push over and above the carbon price, but you have to make that case clearly. Ontario has failed to do so with the FIT (why is solar power worth 4 times more than wind?) and Alberta has so far failed to do this with CCS. Hope they will do so soon. The good new with respect to CO² is that algae eat the stuff. Quite literally, and in the same way that all green plants require CO² to construct sugars that store the energy of the sun (photosynthesis), algae absorbs carbon dioxide and gives off oxygen. It is incredibly easy and less expensive to direct the CO² from industrial processes (refineries, steel smelters, cement plants, common chimneys) to ponds of algae hungry for the stuff. The result is an oil rich vegetable mass that can be separated by a very simple and economical process (see http://originoil.com/ ) . The “green crude” oil thus extracted can be processed in the same “machinery” (of an oil refinery as petroleum crude oil. This makes CCS a PROFIT CENTER not just an added cost. Then, too, transesterification of the “green crude” produces biodiesel, which is called “bio” not just because it comes from plants, but because it is biodegradable as well (let’s not go down the “cloud point” argument again, that was solved with a separation of saturated from non-saturated to a cloud point of -40 degrees and below) (Just incidentally, have you seen common motor oil at -40 degrees? It is thicker than Vaseline petroleum jelly.) Biodiesel is lower in particulates, sulfur free and a higher cetane number than petro-diesel. It has been years since I first said it, but now gas and oil companies have finally, in the last year or two, latched onto the idea that they are the logical ones to be at the forefront of developing alternative fuel sources. Combining creating alternative fuel and the CCS process makes this a “no brainer” to use the CO² to feed the algae. Are our politicians and the public so “no brainer” themselves that it isn’t obvious to them? Ooops, I forgot, … Alberta, home of the CCF, Social Credit and all that. I’m proud of having been an Albertan for most of my life. Love the 0% sales tax, too. “Alberta, where money flows like water because of the oil.” But please, let’s not confuse that with “Alberta, where the water flows like oil, because of the oil.” CCS using algae is logical, practical and “green” in more ways that one. There’s no doubt the long lead-in time for successful CCS and the billions of pre-commercial capital expenditure needed to kick-start the carbon capture, transport and storage industry is enough to make any taxpayer or elected official very nervous. To say that the $2 billion already spent is not enough is no doubt quite true. There’s years of geological research covering millions of square kilometers to do, standards and regulations to develop and billions of infrastructure to be built before such an industry could even begin a comercially viable stage. Without this being done, regardless of what carbon capture technology becomes the most cost-effective in future, will not matter. Without this massive up-front investment, any option to capture carbon from existing fossil fules is lost to us withjout there being the infrastructure, regulations and geological surveys being available. Until government spends the years and billions developing the supporting system, reducing carbon emissions from fossil fiuels will not happen; as simple as that. There can certainly be no commercial incentive to send shops out for years surveying geology or to soend billions pipelines. This is a job for government. Some people find the up-front pre-comercial expenditure needed by government in the early years as being a reason against it. People should realise there is nothing new about government investing in new infrastructure like roads, bridges or sewerage systems. Last I heard, we didn’t get a lot of return on the sewerage but did it anyway. If we had not, relying on the local merchant to take away our waste would have avoided years of expensive capital works and taxes but no one could argue we would be better off. The aternative to the government not spending the years of pre-comercial work developing the infrastructure and regulations needed to bring a whole new carbon industry into life is for us not to do it. The cost of not doing it means there is no possible way to use any carbon capture technology, of which there are many exciting ones and some less so. It means we need to provide for our increased electricity needs and abandon our existing fossil fuels and still somehow manage to meet a 20-30% cut in emissions by 2020 (8 years) using only solar, wind and geothermal. Beyond that, most scientists agree that the sage level of CO2 in our atmosphere was 350ppm which we went way beyond years ago. It’s hard to see how we can get our emissions down to zero, which they ultimately will need to be so that we can make sure atmospheric CO2 doesn’t exceed a maximum of 450ppm and then, the public might as well accept this, that we will have to start removing CO2 from the atmosphere so that we go from 450ppm back down to levels in 1990’s of 350ppm when there were less ice bergs melting. Even if we went to 100% renewables tomorrow morning, we may still find we wanted carbon capture technology up our sleeve. To suggest it might not be able to compete with the alternatives, is to abandon an elaborate suite of exciting options and, I believe, to ignore the suggestion that we are not in a position to pick and chose. We need maximum investment in all of these options, and need them this year so the concrete infrastructure can be put into place next year. We don’t have another 12 months left to debate these issues. The shovels have to come out on all these options. I agree with the observation that since CCS will take billions and several years to get ready on a commercial scale, in the emantime, we also need to focus on commercial-scale biomass such as algae, and the renewables we hear so much about. Each of these technologies has a specific place in our timeline and we could well be dooming ourselves to an expensive and dangerous future if we don’t make sure CCS is available to us, like a sewerage plant, down the track. I keep trying to shorten this but to no avail. Sorry it is so long. Thanks for reading my humble opinions. Thanks for commenting Darren. Have enjoyed brief chats on Twitter, so nice to have you engaged here too. I agree 100% with your sewerage example. I have actually used the analogy of garbage disposal, since there are some good partnerships (industrial recycling) where both parties can make money on waste disposal, which I see as analogous to EOR and a low-cost source of carbon. Obviously, ppl drill for CO2 in order to inject it into oil wells, so this is possible. Problem is to assume that will be the case across all opportunities. To me, that is the issue here in Alberta – that people see it like oil sands, where an initial investment will get the technology going and then the market will take off on its own. I agree that CCS is absolutely needed to meet global GHG emissions reduction targets, and am actually quite a strong proponent of the technology and its deployment. I also think that the $2 billion is a good idea. My worry, as I am going to write in an upcoming column, is that the government has not closed all the loose ends with respect to what it has promised and what it will deliver. In the end, as a result, we may spend a lot of our money on a global problem and still end up painted as climate pariahs while others can profit from learnings we have paid for. I would very much like to see, as I gather is the push in Australia, for a strong carbon price with some further enabling funding for additional CCS technology. Then, as you say, it won’t be for us to debate but for the market to decide. We certainly have seen in Northern Alberta what happens when the appropriate market conditions exist for development of a new and unconventional technology – a lot of capital gets deployed very quickly. The same thing would happen with CCS, or another technology, with carbon pricing clearly and permanently in place. I hope to see it someday soon. YOu are quite correct about the situation being somewhat different here. First, there’s virtually no real use for EOR here in Australia. Our oil is easily extracted so that doesn’t enter the picture. We would have to do it without any potential return from EOR. Obviously, there’s benefits to CCS beyond EOR. The isue I understand is that, alhtough we do seem to have convenient access to some appropriate storage areas near our Victorian coal reserves, it would not be enough and either way, vast resources need to go into studying safe places to store CO2. There has been much work done here already which has demonstrated ceratin geological layers of sedementary rock are ideal and safe, but this will take many years and also needs to address what we do about the existing preliminary data which is currently in the hands of oil companies. It seems silly for us to re-survey millions of square km which has already been done, in part, by oil companies. There is also lack of survey ships. I am also confused, as a rssult of some scientists being confused, why so many new CCS projects which were to happen on-shore, are now being moved off-shore. The reason may be that the survey licences are easier to deal with but maybe no other scientific reasons. Red tape such as this could end up meaning we all pay too much for our electricity. I think we all agree that in the end, we want the cheapest electricity we can get while we meet our targets. I hope Australia’s new carbon tax, due to bein July 2012, provides the incentives we need to promore the large investments in renewables and somehow into CCS. I had heard that a simple carbon tax alone would not be enough to kick start CCS though. This could be a problem if we need more than that. Clearly we all have a lot more to work out. I would like to address several points raised in the above blog post. It is mentioned that CCS will require perpetual government funding of $50/t and that there is no exit strategy for government. This is not the case. The main driver for CCS is addressing climate change and CCS has been identified, both in Alberta and globally, as an essential tool to reduce CO2 emissions. We simply cannot meet CO2 reduction targets without CCS and the volume of reductions available through CCS are a necessary piece of Alberta’s, Canada’s and the world’s effort to address climate change. As we recognize the need for CCS, we also know that it will cost money to deploy. In the future climate change policy will drive CCS deployment, but in the early years, when the technology application is new and climate change policy is only emerging, CCS is not commercial. It is in this early transition phase that government has a role to assist deployment. Regarding cost decreases, over time, as CCS facilities are built around the world, costs are indeed expected to decline. And they are expected to decline significantly. Technology learning curves are well established and as this occurs for CCS we will see the technology be applied to more and more facilities. Also note that the graph referenced by Ian Murray is not a supply cost curve over time, but a snapshot of supply costs today. It is also important to recognize that no jurisdiction can do this all on their own. 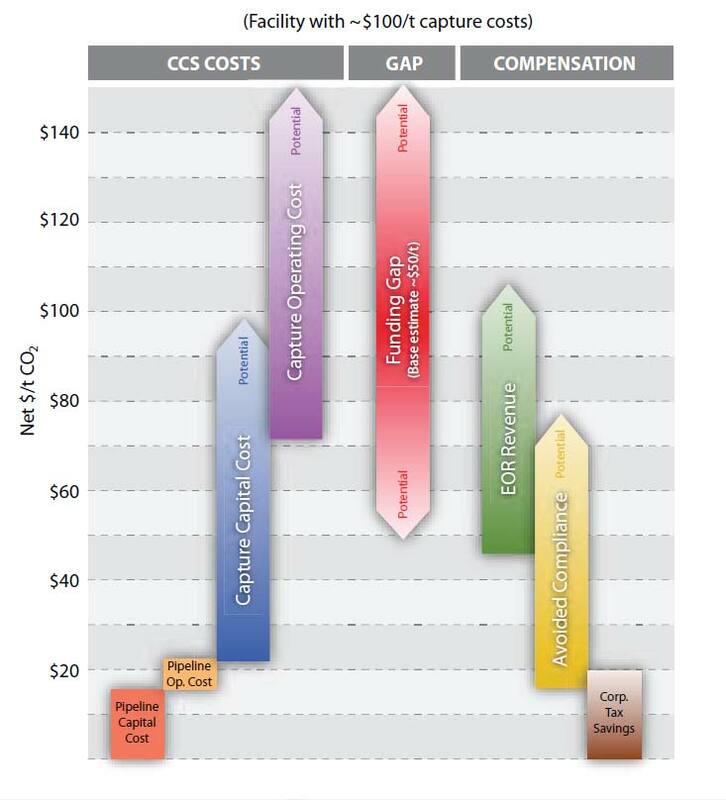 Cost declines will only happen when CCS is deployed around the world. Similarly, Canada and Alberta cannot move too far ahead of our trading partners, primarily the United States, on climate change policy for risk of loosing investment. Let us be clear that large scale CCS will not occur in Alberta unless the world also gets serious about reducing CO2 emissions and it is important to look at future deployment with this perspective. Regarding costs, the other dynamic that is not mentioned in the blog post above is that the deployment of CCS in Alberta is an investment in advancing an enhanced oil recovery (EOR) industry in the province. The Alberta CCS Development Council estimated that this industry would result in $11 – $25 billion in additional royalties, far outweighing the initial $2B investment. And these estimates were made at a $75 per barrel oil price. Regarding the fourth hard truth, we are in agreement that climate change policy should not be prescriptive and that fuel switching to natural gas should be an option for many companies. However, fuel switching is not the answer for all companies. Further, it will not reduce CO2 to the levels required, so capital stock replacement from for example, coal to gas may be short sighted at best. CCS is needed and policy must support CCS development to set the stage for Alberta’s future. Thanks for the opportunity to provide our perspective on a meaty issue. Healthy debate is the way these initiatives move forward in the best possible way. Wonderful to have you both reading and commenting. I don’t disagree with your opening that CCS is a critical technology in the global fight against climate change, and I agree that CCS would still need to be a part of the solution to meeting Alberta’s GHG targets. I also recognize the fact that it will cost money to deploy. That said, we clearly don’t disagree on the reality that 20Mt/yr in Alberta is going to take a lot more policy intervention than is currently in place, correct? Regarding cost decreases, I certainly am aware of the learning that should be expected in CCS, and have not ignored that in my conclusions. The Ian Murray cost curve is a snapshot of the merit order today over quantities, and we should expect that to drop over time and perhaps we should expect greater drops from higher cost sources. Still, you will certainly have an upward sloping merit order at points in the future, just with lower costs for similar deployments. So, looking at a particular application which might cost $200/ton given today’s technology, learning might bring that cost down by 50% between now and 2020, but it would still cost more than some of the lower-cost opportunities being deployed today. I would love to see some ICO2N modelling of what the merit order (or perhaps what this graph http://www.ico2n.com/what-is-carbon-capture/carbon-capture-storage-economics/capture-economics) will look like as we deploy CCS and these learning effects take hold. Obviously, I get out of my technical comfort zone quickly, and you can certainly do a better job of this than I can. The reality is that you have to move along (and thus up) the supply curve to get the increases in quantities, while that supply curve is shifting down over time with learning and with the replacement of older capital. Perhaps the learning and capital replacement will be fast enough to outstrip the need to move to more challenging applications, but it seems equally possible that it will not. I also agree that cost decreases will not happen without action elsewhere, which re-enforces my points about the risk to Alberta. We will not get a lot of sympathy if we say that we did not meet our GHG targets because no one else deployed CCS. On the EOR royalties, treating the royalties as a windfall assumes that those barrels would not otherwise be produced. Likely, increasing EOR is at best a shifting forward of royalty revenues and oil production in time, especially since EOR is being deployed a lot of places in the world and the knowledge and technology will not doubt improve and lower the costs per barrel (can’t have learning only when it’s advantageous to your arguments, right?). As you know and as we can see in places such as Wyoming and Texas and even in Alberta, EOR is viable and able to pay for CO2 at today’s oil prices in the right plays. To suggest that these barrels would not otherwise be produced is a stretch, although I agree that they would not be produced today. I think it’s poor accounting (or at least naive cash flow analysis) to treat those royalties as a pure payback on the $2 billion because there is a foregone capital asset that is not being valued in that calculation. You did not address the lack of an exit strategy for the government, which I am most curious about. I think we both agree, and your modelling (http://www.ico2n.com/what-is-carbon-capture/carbon-capture-storage-economics) certainly shows a need for a much more aggressive climate policy to drive the business case for CCS. I’m glad that we also agree on the need for a flexible, not prescriptive policy. In the absence of that, the cost gap is not closed at any quantity close to 20Mt/yr by 2020 or 139Mt/yr by 2050. I certainly agree with you that a commitment to a $100ish/ton carbon price would drive a lot of the CCS goals (although fewer than would have been the case with $20/GJ gas and a $100/ton carbon charge), but that’s not been committed to yet. Otherwise, I don’t see how you get there without either a big regulatory stick or an expensive commitment to an ongoing pay-for-results approach. Thanks again for engaging on my blog and for your work on the file as well. I make a lot of use of your site and resources in my teaching which is also much appreciated. Thank you for your comments and the discussion. Some further thoughts in response to your questions/points. I agree there will be an upward sloping merit curve for CCS applications. As you say, we will “have to move along (and thus up) the supply curve to get the increases in quantities, while that supply curve is shifting down over time with learning”. However, it is important to emphasize that there are significant CO2 volumes available both in the near and medium term towards the bottom end of the CCS supply curve. And as technology improves and costs decline these volumes will be even more appropriate for capture. The snapshot you have of the volume curve in 2020 shows that upwards of 30 million tonnes of CO2 are available for a price of less that $125-$150 per tonne. With only a small portion of this being captured by the initial 4 projects in Alberta (5 Mt) there is still significant volume available at the lower end of the cost curve. Note: This cost/volume curve is also available on the ICO2N website with a description of the various cost thresholds: http://www.ico2n.com/what-is-carbon-capture/carbon-capture-storage-economics/total-costs. The volumes available at the high end of the cost profile (upwards of $200/tonne and above) will be targeted as part of future CCS deployment and it is the expected cost declines that will make these volumes applicable for CCS. There are many economic reports in Canada and globally that identify the need for carbon costs nearing, if not more than, $100/tonne as we move out towards 2050. And note that this is the price that will be needed for all technologies, not just CCS, in order to meet society’s CO2 reduction targets. It is the combination of future climate change policy (carbon price) and technology cost declines will make capture at the more expensive sites viable. On your point about Alberta being exposed, I believe this should be looked at from a different perspective. If CCS is not progressed globally then the world (not just Alberta) will be short of its GHG targets. This would be an indication that the world’s priority for addressing climate change has diminished and Alberta would not be alone. Alberta and Canada’s climate change plan is, to a large degree, tied to international developments as much as CCS deployment is. Regarding EOR, the situation in the U.S. is different from that in Canada. In the U.S. the majority of CO2 is from natural sources rather than CO2 captured from industrial facilities. The nascent EOR industry in Canada can not pay enough for CO2 to cover the costs associated with CO2 capture. As with many other industries, government involvement can play a critical role in helping with early development. This indeed is happening for wind, solar and other renewable technologies around the world and, closer to home, government assistance was crucial to help develop Alberta’s oil sands industry. Lastly, to comment on the idea of an exit strategy for government I re-iterate my point above that neither Alberta, nor Canada, can move alone on climate change policy. The province/country cannot be too far out of line with our trading partners for fear of losing investment. The long-term policy development that is needed to drive CCS is therefore tied to global developments and this international perspective cannot be overlooked. It is these international developments that will drive both the necessary policy in Canada and the global CCS deployment needed to reduce costs. And assuming that the world does move on climate change, there is a natural progression to commercial CCS through both tightening climate change policy and CCS cost declines. 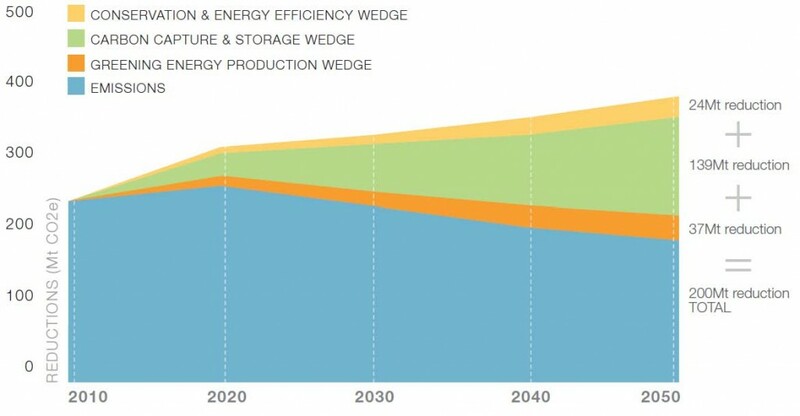 This is graphically displayed on the ICO2N website: http://www.ico2n.com/what-is-carbon-capture/carbon-capture-storage-economics/transition. I’d like to come back to the fact that CCS is a critical technology for Canada and Alberta. While it is not the only answer to reducing CO¬2 and all technologies must be pursued, CCS has been identified as the largest single tool to reduce CO2 emissions. It must be progressed if the country/province is to position itself for future deployment. Thanks again for the good discussion and I’m glad to hear you are using the ICO2N website for CCS info. I think we agree on most of the information, but perhaps disagree on the interpretation. My point, which I think is supported by your supply curve, is that if we are looking for 20-30Mt of CCS by 2020, we are talking about a $2-4 billion per year policy. The key for me is that there has been little discussion outside of the small circle of government and industry people working on this problem which puts that into the public debate. If I use a rough average of $75/ton for the cost of the first 30Mt on your supply curve, that’s 2.25 billion per year that must be covered off by some combination of avoided carbon prices, EOR revenues, and government pay-for-results funding in order for there to be a business case for it. This is entirely consistent with the CCS Development Council final report saying that ongoing funding in that ballpark would be required. I think perhaps you are mis-interpreting my view of CCS. I am not at all against government involvement in emissions reduction, not am I against our involvement in deploying CCS technology. What I am against is the government having goals which are not matched by policies. I expect that you would agree that with the current policies in place, we will get about 5Mt/yr of CCS, and a few other marginal emissions reductions from the SGER, and that’s about it. There is no question that we have written down climate change goals which would put us far out of step with almost anyone in the world on carbon prices (no one is contemplating $200/ton reductions in the near term) and that meeting those goals will cost us some investment. I think, however, that the carbon competitiveness view has been significantly overplayed. If you look at the work by Robert Stavins, he highlights the tax differences which currently exist across jurisdictions which trump any potential differences brought about by carbon prices. I think we have very high value potential uses for carbon in Alberta, and I think we risk a great deal from continually telling the world that our oilsands sector and our economy as a whole is not viable under aggressive carbon policy. To me, that just makes it an easier target. Really enjoying this discussion. I hope you don’t see me as attacking your work, because that is absolutely not my intent. I would simply like the discussion around CCS policy to be focusing on the types of policy that we will need to meet our targets. To pick up on this discussion, post cancellation of the TransAlta’s Pioneer CCS project, a number of questions will undoubtedly be raised as to what went wrong and if this is a foreshadowing of turbulent times for CCS in Alberta (and Alberta Climate policy). I notice that TAU’s two official reasons are: 1) insufficient market for CO2, and 2) lack of a high enough policy-driven carbon price. I wonder if the first reason relates to what the economist Nassim Nicholas Taleb calls a Black Swan event – something with a low probability that comes out of nowhere and causes a major impact to systems – in this case the energy system. I wonder if horizontal drilling and mulitistage fracing is revolutionizing not only the NG industry but perhaps also the conventional EOR industry such that the demand for CO2 may be dropping as companies switch to HMF for EOR? The price of oil is still very high, so that’s not it. I think that clastic reservoirs may be more amenable to HMF techniques, while carbonates (like at the Redwater CCS project) may still be more amenable to CO2 flood, but not sure. If HMF is becoming a major economic force in the Alberta energy sector, it would certainly have an impact on the economics of the other Alberta CCS projects. Perhaps, even globally as HMF gains traction around the world? Glad to have you joining in the discussion. I think you are right on this. As you know, I’ve always had the impression that the projects were based on aggressive assumptions for the market for CO2, and I have been concerned that these prices would not be robust to increasing the quantities of CO2 available. Normally, you would have expected the un-anticipated in crease in oil prices to compensate for this by increasing the revenue generated in EOR per ton of CO2, but I agree with you that some of that is being offset by more attractive investments in HMF. I expect this will have significant implications for the other projects as well, but at least they have a market with 1 million fewer tons of CO2 in it now.